What are the products specification? How are defined the different heights used in altimetry? What is the resolution of the L4 gridded products? What about the mean reference period? Where can I find the AVISO products I used to download? What are the differences between the Marine and Climate sea level Products? What about the Global Mean Sea Level (MSL) Indicator? What product should I use to compute the Global Mean Sea Level indicator? Are DUACS products corrected for the TOPEX-A instrumental drift? Should I use the NRT products to extend the MSL record? 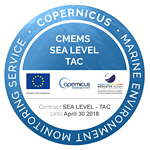 What are the CMEMS ‘phy_assim’ Products? Eastern Mediterranean sea sea level anomalies on Nov. 15, 2017. The Ierapetra gyre is a semi-permanent anticyclonic eddy South-East of Crete, in the Eastern Mediterranean. This intense anticyclone is considered as wind forced by the Etesian winds. This regional wind is channelized by the Cretan mountains and induces locally a significant wind stress curl. The maximum eddy intensity is usually reached in Fall when the Ierapetra gyre is located around its climatological mean position (27°E, 34.3°N). However, the intensity of the gyre varies significantly from year to year, in particular when a preexisting gyre is already present in the generation area. It is then likely to be intensified and thus prevent the formation of a new one during the period of strong Etesian winds. Monthly mean position of the Ierapetra gyre centers overlaid on Mean Dynamic Topography (a-c). 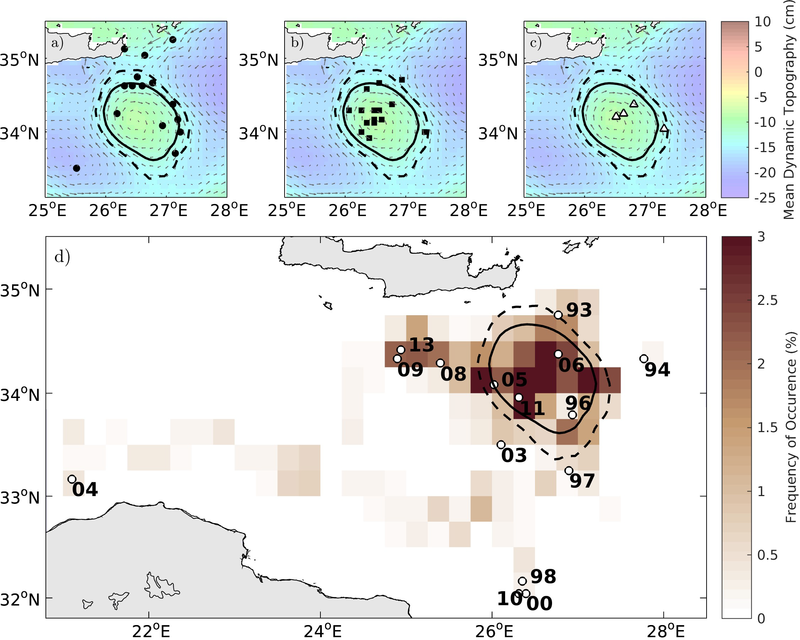 The first points of detection are plotted in panel a), the gyre location where they reach maturity or intensification are plotted in panels (b) and (c) while the point of last detection is depicted in the bottom panel (d)(density probability of the position of the center). The characteristic contour and the latest contour deduced from this climatological mean are plotted in black solid and dashed lines respectively. Once generated, the gyre generally stays around its formation area but some years it moves away following a dynamical evolution and a trajectory which is complex and does not seem to follow a general path. Besides, the eddies can merge with another anticyclone or split in two. The consecutive mergings are likely to lead to very long lifetimes that could exceed three years. 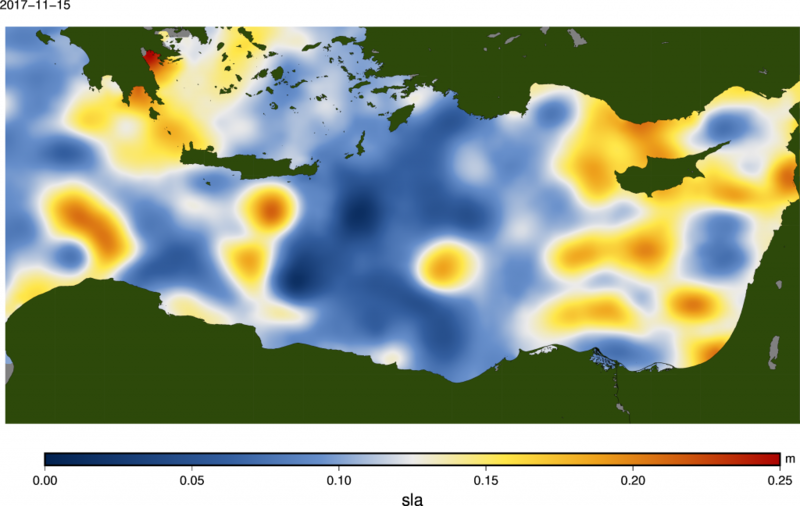 A recent studies has shown the year-to-year position and intensity to the Ierapetra gyre for 22 years, using Duacs data (Delayed-time Absolute Dynamic Topography) and the Ameda eddy-detection algorithm.